The poems I have selected for this week all have a lyrical quality and have been influenced by American forms of music including Folk Music, Blues, Jazz, and Rap. I want you to think about the relationship between music lyrics and poetry. In what ways are they similar? How does the musical accompaniment of a song echo the tone and mood of a poem? Also, consider how these different genres of music can express ideas and experiences in unique ways. Dudley Randall (1914-2000) wrote “Ballad of Birmingham” within the context of the Civil Rights Movement of the 1960s. I want you to consider deeply what comes into your mind when you think of the Civil Rights era. Perhaps Martin Luther King Jr., Rosa Parks, The Freedom Riders, The March on Washington for Jobs and Freedom”, The “I Have a Dream Speech”, or other icons and images that characterized the time period. “Ballad of Birmingham depicts another infamous moment of the Civil Rights movement, the 1963 bombing of the 16th Street Baptist Church in Birmingham, Alabama. Four young girls died when members of the Ku Klux Klan set off an explosive device during the church services on a Sunday. The church was targeted because it often served as a meeting place for civil rights leaders like Martin Luther King Jr. The event gained national attention and it helped galvanize support for the Civil Rights Act of 1964 when Americans from outside the area saw what African Americans were subjected to in segregated cities. For more information on the history of the poem, check out http://www.balladofbirmingham.org. When you read this poem, pay attention to it as a narrative, and by that I mean its story. What happens in this story? Who are the characters? What is the “tension” in the story and how does it (hint: tragically) get resolved? Also, think about how this poem describes the climate of Birmingham during the Civil Rights Era. What’s happening on the streets and why is it assumed that the church would be safer? What point is Dudley trying to make about the bombing with this story? As a short story in stanzas told in the folk tradition, Randall’s poem fits parts of the traditional definition of a ballad. Ballads are derived from the Middle Ages when minstrels would set the stories of gallant knights to music to entertain and spread their legends. Thus, by calling the poem a ballad, Randall’s poem aims at spreading the story of the young girls killed in the bombing. The poem became a literal ballad in 1968 when Jerry Moore set the poem to music. As you listen to the song, think about the kind of tone Moore creates for the song with the instrumental accompaniment and his slow vocal pace. How would you describe this tone? Does it change or alter the way you feel about the poem? Does hearing the voice of a man sing the dialogue between a mother and a little girl alter the persona of the poem? First off, I would like you to read the poem aloud. How did you perform it? Which words did you stress? Now, listen to this YouTube clip of Gwendolyn Brooks (1917-2000) reading the poem. When Brooks reads the poem, it has a musical quality in it. Brooks, who wrote in Chicago, was heavily influenced by the jazz music of the era. She was one of the most famous African-American writers of the 20th century, a Pulitzer Prize winner, and a Poet Laureate. Now that you have heard Brooks read the poem and explain the story behind it, think about how that changes your reading of the poem. Do you notice anything different about the poem? Can you envision the characters in the pool hall? Also, notice how Brooks states that the word “jazz” was not meant to be sexual, but musical. Yet, she does not mind that literary critics took it to mean that. Let this give you faith that it is okay to have your own interpretation, even if it differs from the author’s. Our anthology clearly thinks it was meant to be sexual. 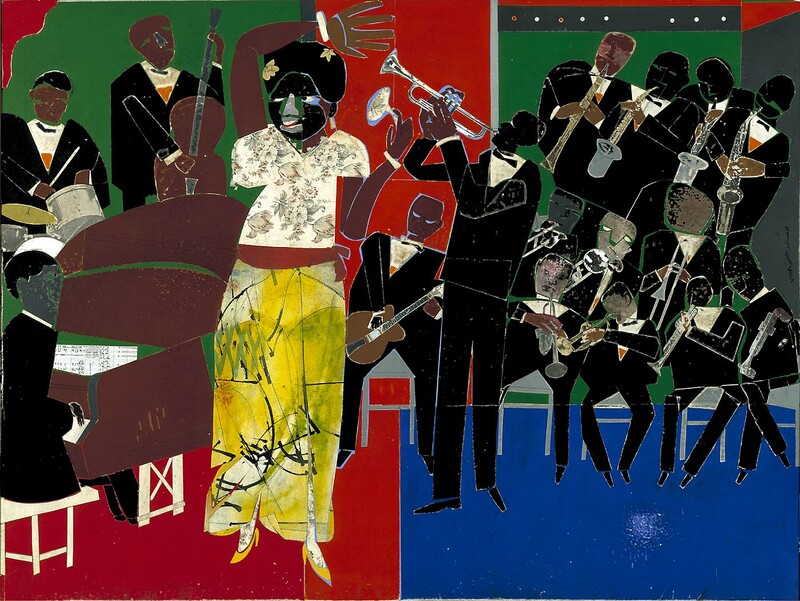 How does a sexual versus a musical interpretation of the word “jazz” in the poem alter its meaning? Notice how the word “We” in each sentence begins on a different line from the rest of the sentence. This is called enjambment, which is defined formally in your list of literary elements. Think about how Brooks performed and pronounced the word “We” when she read it. The “We” is almost musical, like a note held long at the end of a verse before another begins. Consider the rhyme and meter of the poem. List all of the rhymed couplets of words and think about what they have in common with each other and how they paint the picture of the delinquent youths. Think about how this builds the “persona” of the poem, its speaker. How does the grammar and tone fit the persona of the poem? Below is a YouTube clip with the original recording of “White Lines” (1983) and a link to the lyrics. 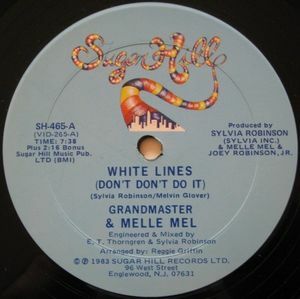 The song is often attributed to Grandmaster Flash as marketing gimmick (he was the biggest rapper in the world at the time), but its writer and performer was actually Melle Mel. “White Lines” is one of the iconic songs of the early days of rap. As you probably picked up on, the white lines refer to cocaine and the song has an anti-drug message. The 1980s saw an explosion in drug related crimes in America, and one of the hardest hit areas was the inner city and the African American community. The economic recessions of the 80s lead to high unemployment combined with a cut to social welfare programs, which in turn lead to higher rates of crime and drug trafficking. In this song, Melle Mel paints a portrait of how the drug epidemic is affecting the African American community in the 80s. As you listen, list off all the metaphors he uses for describing cocaine and their effects. How does this build his anti-drug message? How does he describe its effect on the community? What is his argument in this stanza? Consider the fact that in the 80s, new drug laws punished crack cocaine (which was commonly, though not accurately, thought of as a “black” drug) harsher than pure cocaine (which was commonly thought of a drug used by the more wealthy). Finally, I want you to think about why I included a rap song in a lesson about poetry. What does this song have in common with Brooks’s and Dudley’s poems? I want you to consider both their common themes and their usage of literary devices. Look over the song’s lyrics. Can you spot a rhyme scheme, meter, or any other elements of poetic form? Does this mean that rap is poetry? Could you imagine setting “We Real Cool” or “Ballad of Birmingham” to a beat and rapping it? 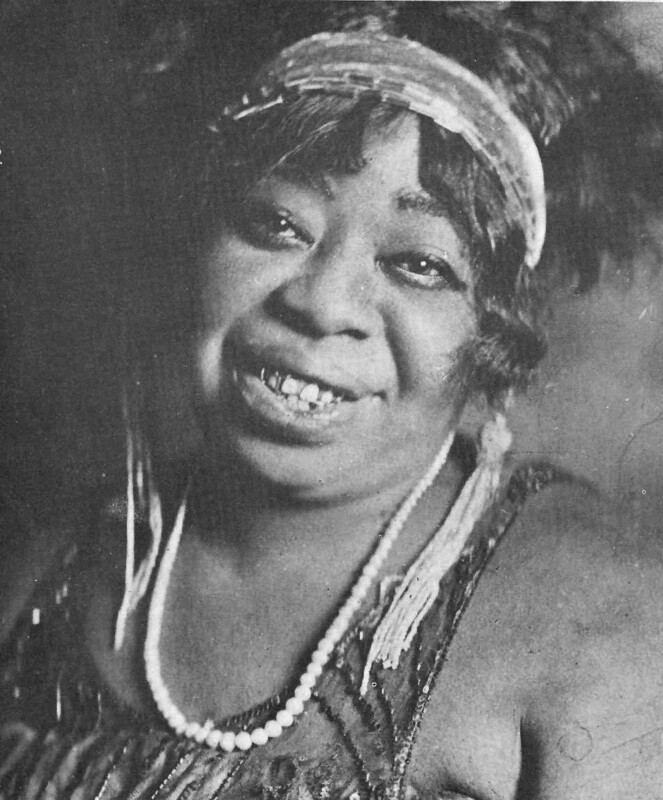 Called the “Mother of the Blues” by her record label, it can be argued that Ma Rainey was the most influential of all the female blues singers. A raw, emotional vocalist with a sound firmly rooted in the country blues tradition, onstage Rainey dressed as a blues diva in sequined gowns and loads of jewelry. Her songwriting skills were brilliant in their simplicity and she was a populist lyricist whose work resounded with poor Southern African-Americans. Rainey directly influenced younger contemporaries like Bessie Smith and Ida Cox, as well as contemporary blues women like Marcia Ball and Bonnie Raitt. Rainey was born Gertrude Pridgett in Columbus, Georgia to a musical family. Both her parents were minstrel singers, and it is believed that Rainey first performed onstage at the age of fourteen, and soon she was a veteran of the minstrel and medicine show circuit. Marrying minstrel song and dance man William “Pa” Rainey in 1904, Gertrude became known as “Ma Rainey” to her audience. The pair traveled across the Southeast, billing themselves as “Rainey and Rainey, Assassinators of the Blues,” first touring with the Rabbit Foot Minstrels. It was here that Rainey befriended and taught a young Bessie Smith the blues. The Raineys later toured with Tolliver’s Circus and Musical Extravaganza, and other traveling tent shows. Rainey was a popular performer with Southeast audiences, and became a featured performer on the Theater Owner’s Booking Association circuit during the early 1920s. Rainey’s recording career was short-lived, lasting only six years, but during that time she recorded a whopping 100+ sides, often backed by such top-notch jazz players as Louis Armstrong, Kid Ory, Fletcher Henderson, and Coleman Hawkins, as well as her regular band members. Rainey possessed a wide repertoire of songs, and also recorded with jug bands as well as with guitarists like Tampa Red and Blind Blake. Although Rainey found commercial success with her records during the late-1920s, her career dropped off during the early-30s as female blues singers fell out of favor with the public and were largely supplanted by their male counterparts. Rainey retired from the road in 1933 and, having squirreled away enough savings to live comfortably, returned to Columbus. Rainey would die of a heart attack in 1939, but so influential was her music that she was inducted into the Blues Hall of Fame in 1983, and the Rock & Roll Hall of Fame in 1990. “Booze and Blues” has all the hallmarks of a typical Blues song. Structurally, it as a consistent meter and rhyme scheme and repeats the first line of each stanza for emphasis. This is called the “AAB” pattern, “consisting of a line sung over the four first bars, its repetition over the next four.” (Blues) Thematically it engages some of the common topics found in Blues songs: problems with a lover, problems with the law, poverty, drowning your worries in alcohol, and constant references to one’s personal “blues”. The Blues can encompass a variety of emotions. As you listen to the song and hear Rainey’s performance, how would you characterize her feelings of the blues? How does her performance add meaning and expression to the lyrics of the song? How does the form of a Blues song send a particular message about the topics like love, poverty, alcoholism, and prison that Rainey sings about? Now that we have a good understanding of the Blues through Ma Rainey’s life and artistry, read Al Young’s “A Dance for Ma Rainey” from the anthology and Stirling Brown’s poem “Ma Rainey” copied below. As you read both poems I want you to focus on how they characterize Rainey as an icon and describe the effect of her music. We mus’ go. . . .
Let’s start with Stirling Brown’s poem. You probably noticed the shout out to Southern Missouri right off the bat. Cape’s location on the Mississippi River places directly on the artery of blues music in America, which flows down to the Mississippi Delta and New Orleans (both mentioned in the poem) where the Blues was developed by black farm workers in the 19th century. Stirling Brown was an anthropologist and a Harvard professor, yet he decided to write this poem in the vernacular, meaning that he used slang terms. What effect does this have on the poem? How does the tone of vernacular fit Rainey’s music? A large part of the poem is devoted to how people are drawn to her music and come from far and wide to listen to her. As you read the poem, look for how Brown describes Rainey and the effect of her music on the audience. What kinds of feelings and experiences does Rainey express and how does her audience relate to it? What does this say about the power of the Blues as an art form? And now, “A Dance for Ma Rainey.” Unlike Brown who wrote his poem in the 30s when Rainey was a popular recording star, Al Young was from a later generation and wrote his poem in the late 60s, well after Rainey’s death. It would be like one of you writing a poem about Kurt Cobain, a musical icon from a previous generation. Thus, as you read Young’s poem, I want you to look at how he depicts the iconography of Ma Rainey. What is it about her that made her legendary well past her own generation? Also, think about the nature of icons in music. Why do we revere certain artists for decades to come, put their posters on our walls, and feel like we have a kind of relationship with them? Consider an iconic musician you revere and compare your feelings about him or her to how Young describes how Rainey influences him. Pay attention to how he describes her appearance and the power of her voice. Iconography often means thinking about history and how the icon represents the way in which a culture lived during its time. In this poem, Young talks about African-American history through Blues and poetry, which Ma Rainey’s voice channels. Toward the end, he talks about the experience of slaves in the Delta and how Rainey’s voice (which came well after slavery) echoes the suffering of those ancestors. Thus, we could also consider how the issues Rainey faced as a black woman in the South in the 20s are similar to or different than what Young faced in the 60s during the Civil Rights Movement. What similarities and differences between his life and Rainey’s life does Young bring up in this poem? Finally, does Young’s poem have the same tone and voice as Rainey’s music? Compare it to Brown’s poem. How do their different choices of literary devices cover different characteristics of Rainey as a singer and icon?